BUZZ Communications Celebrates 10 Years as Trusted PR Agency and pledges to continue to guide the Brand Building Journey! 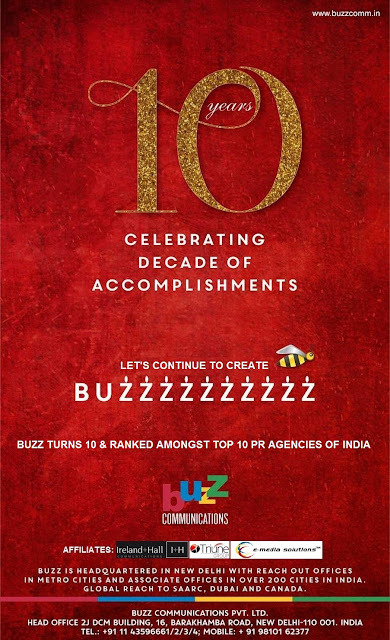 Recently BUZZ has been adjudged amongst Top10 PR Agencies of India! New Delhi, India – February 09, 2017 - As a leading Public Relations advisory firm, BUZZ Communications today celebrates a decade of Accomplishment by helping Clients build their brand equity. As one of the fastest growing Public Relations Agencies, BUZZ has achieved significant organic growth since its inception in February 2007. Today, BUZZ’s reach is Pan India (Headquarter in New Delhi, Reachout Offices in Metro Cities and Associate Offices in over 200 cities). To give International reach to its Clients, BUZZ has also forayed globally, with strategic Alliances in SAARC, Dubai and Canada. Focusing on equipping Clients to build sustainable platforms in new markets, BUZZ Communications has made a reputation by working on leading international brands in India viz TOYOTA, JCB, HITACHI, Tata Hitachi, KONE, European Union, La Trobe University, Ajman Free Zone…to name a few and having them flourish within the continent of Asia with the necessary tools to generate buzz across PAN India resulting in long term brand building. “On this memorable occasion, we express our sincere gratitude to our Clients, Affiliates and Media who have supported our endeavors. We look forward to your continuous encouragement as we devote ourselves to forever exceeding expectations, while staying the course of integrity, quality and agility. I dare say that our Clients have been hugely benefitted by our professional services, which in turn has helped us earn desired credibility in the market place.” added Achal Paul. "It is indeed a great pleasure for us to work with BUZZ Communications as their Affiliate Partner in Bangladesh. During our long association, we have found them a thorough professional full service PR and Communications Agency under the able guidance and leadership of its Founder Director Achal Paul. We have worked with them on a number of projects and it was always a rewarding experience for us. On this auspicious occasion of 10th anniversary of the Company, we extend our heartiest felicitations to Achal and his Team, and wish them all best in years to come" says Kazi Wahidul Alam Chairman & Managing Director of Triune Group, Bangladesh.